Following the Royalist defeat at Naseby, the port of Chester was besieged by Parliamentary forces. If the King was to get reinforcements from Ireland, he needed to ensure the city did not fall. 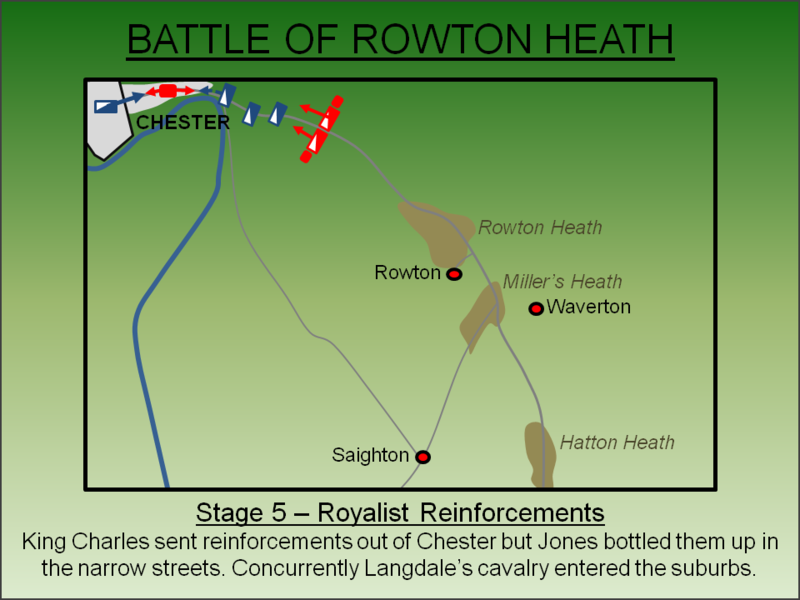 At the Battle of Rowton Heath (1645), his attempts to lift the siege failed spectacularly and the remaining Royalist cavalry force was comprehensively defeated. At the Battle of Naseby, fought on 14 June 1645, Parliament decisively defeated the last substantial Royalist field army in England. Although the King was able to salvage around 4,000 cavalry from this disaster, he no longer had any significant infantry regiments and accordingly Parliament became the dominant force. The Royalist held ports of Bristol and Chester were besieged threatening the King's ability to import fresh troops from Ireland or the continent; if both fell the war would effectively be over. Faced with defeat in England, King Charles planned to move north to Scotland where his commander - James Graham, Marquis of Montrose - was waging a successful war against the pro-Parliament Covenanters. However, the King found his way barred at Doncaster by a combined Parliamentary/Scottish army and instead moved west eluding the forces of General Sydenham Poyntz who had been instructed to shadow him. On the 11 September 1645, Bristol was surrendered to the Parliamentarians by Prince Rupert. As the last substantial Royalist port, Chester now became critical to their war effort. The siege against the city was commanded by Colonel Michael Jones, a veteran soldier with extensive experience of fighting in Ireland. On 19 September his forces launched a surprise assault, captured the earthwork defences that surrounded the city and entered the suburbs. Only the medieval walls were preventing Chester from falling. The King received this news on 22 September, by which time he was at Chirk, and resolved to relieve the city. Parliament's siege on Chester was focused entirely on the eastern side of the city. Accordingly, on the evening of 23 September, King Charles was able to enter Chester from the west. He was accompanied by his lifeguard, a force of around 500 troops. The bulk of the Royalist force had been detached under the command of Sir Marmaduke Langdale with the orders to attack the besiegers on the east. Jones however had anticipated the attack and sent messengers to Poyntz asking him to come to his aid. 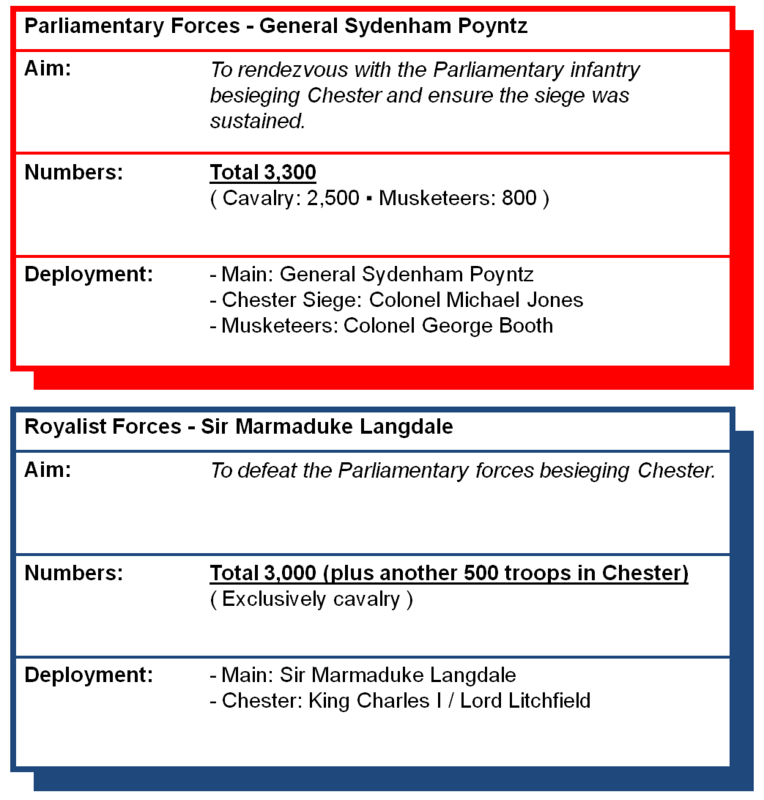 Both the Royalist force under Langdale and the Parliamentarians under Poyntz consisted almost exclusively of mounted troops. The only infantry were the Parliamentary soldiers besieging Chester from the suburbs. The battle was fought on 24 September 1645 over a wide area broadly along the line of the modern A41. However the landscape of the seventeenth century was significantly different than today. 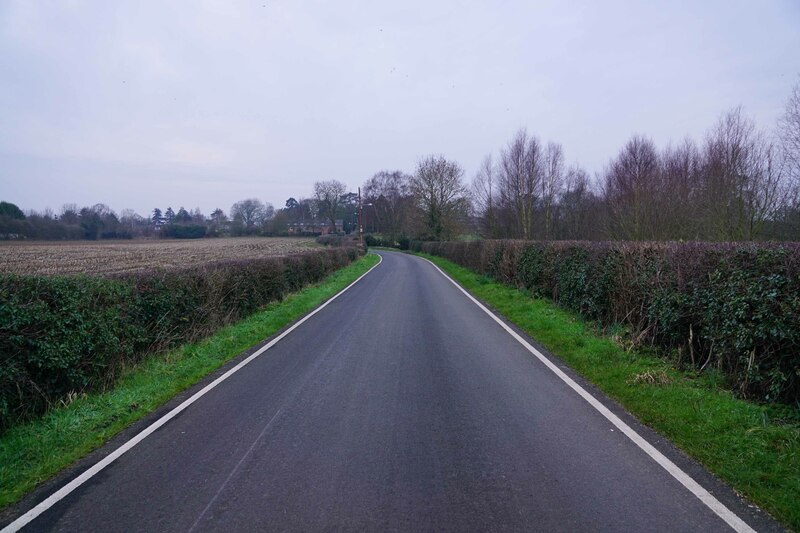 The area was large uncultivated heath whilst the road itself was narrow and lined by hedges. 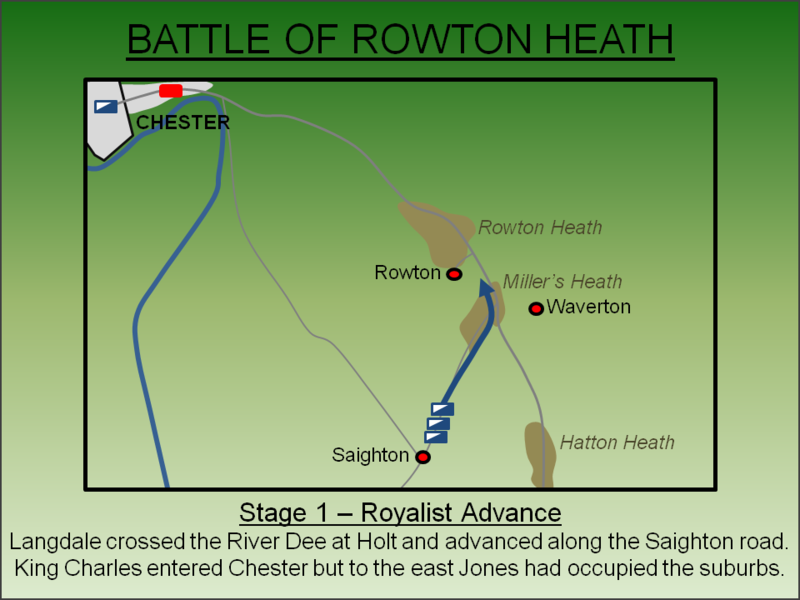 Langdale crossed the River Dee at Holt with a force of around 3,000 cavalry and advanced along what is today Chester Road and Chapel Lane towards Saighton intent on trapping Jones. He camped overnight some four miles south of Chester but overnight his men captured a messenger from Poyntz. Langdale learnt that the Parliamentarian was intending on marching overnight from Whitchurch. 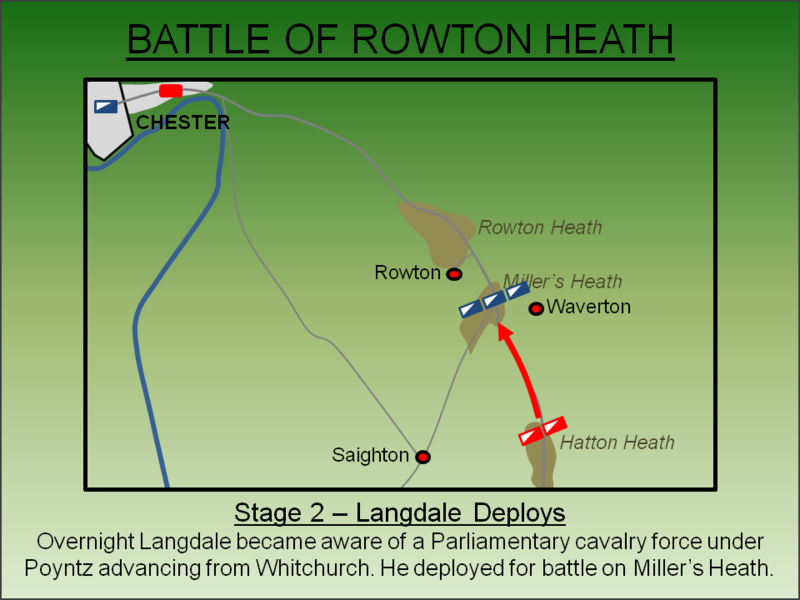 Langdale turned his force onto the line of the modern A41 and occupied high ground in vicinity of Miller's Heath. He drew up his force hoping to lure Poyntz into a head-on assault. Under the command of Colonel Booth, the Parliamentary musketeers skirted round the Royalist line, probably to the west, and rendezvoused with Poyntz’s cavalry. 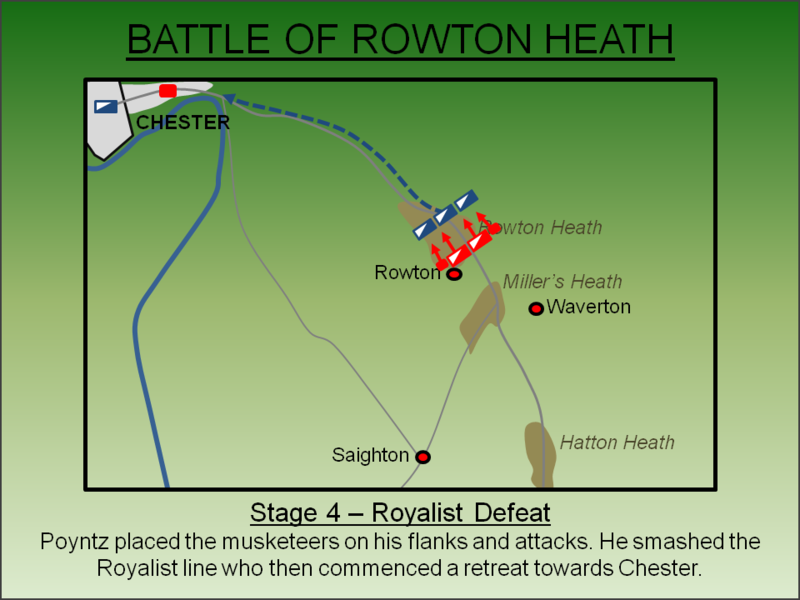 Positioning his infantry on his flanks, Poyntz was able to smash the Royalist line who were pushed back towards the Chester suburbs. Charles, viewing the fighting from Phoenix Tower (now renamed King Charles Tower), dispatched reinforcements under Lord Lichfield. However, Jones still had a sizeable presence within the suburbs and used the narrow lanes to bottle up the Royalists. Concurrently Langdale's force entered the same suburbs and found itself lost in an urban maze. The Royalists took heavy casualties in the suburbs where the Parliamentary infantry were able to simply able to pick them off. 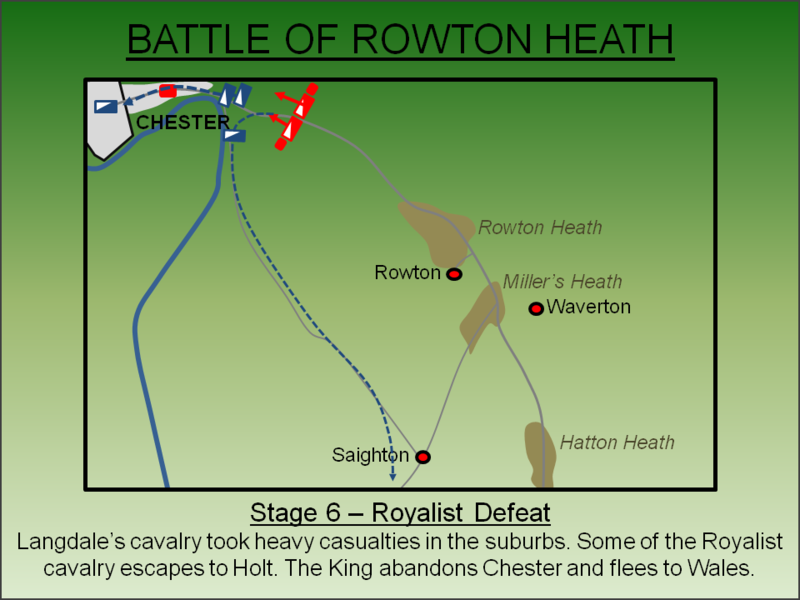 A small portion of the Royalist cavalry escaped back towards Holt, the remnant limped into Chester. The battle was another disaster for the King; Naseby had annihilated his infantry and his surviving cavalry had now also been decimated. Some accounts suggest up to 2,000 Royalists killed or captured although is probable the actual total was closer to 600 killed and 800 captured. Either way it was a comprehensive defeat of the last significant Royalist force in England. Coupled with the vanquishing of James Graham at the Battle of Philiphaugh some days earlier, meant the Royalist war machine had finally been comprehensively beaten. Fearful of becoming trapped by a renewed Parliamentary siege, which he now had no force to counter, the King fled into Wales. Langdale led what was left of the army out of Chester but was defeated at Sherburn-in-Elmet. Chester held out for the King in the vain hope that a new army could be imported from Ireland or the continent but Parliament imposed a close siege and in February 1646 the city surrendered. Lancaster, J.H.D (2014). 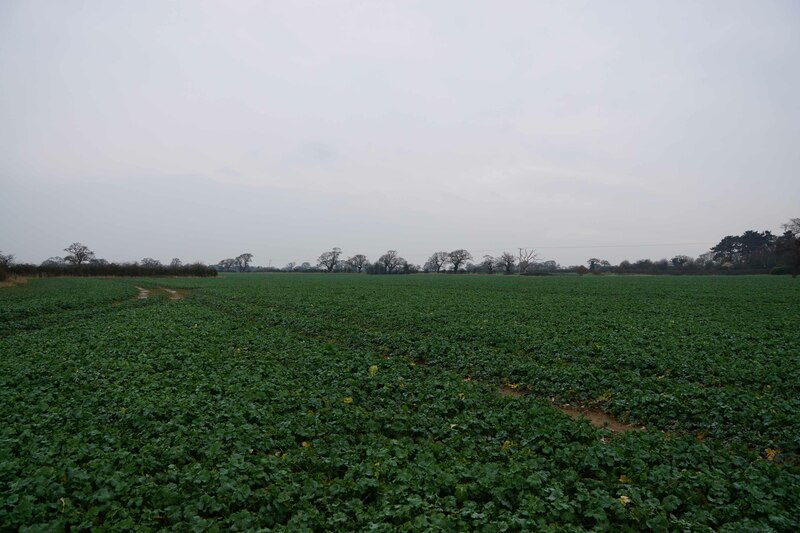 Rowton Heath: Battlefield visit notes and observations. CastlesFortsBattles.co.uk. Ordnance Survey (2015). Waverton. 1:1250. Southampton. There is no monument nor interpretation panels whilst the battlefield itself has changed significantly from the seventeenth century. The A41, which broadly follows the line of the Royalist retreat into Chester, is much wider than the narrow lane of 1645. Rowton Heath, largely open uncultivated ground at the time of the battle, is farmland now. The Chester suburbs, where the King's force met its end, has changed beyond all recognition. Notwithstanding these changes, there is good access to all parts of the battlefield - the A41 has a footpath whilst the minor roads that connect to it are quiet enough for pedestrians. A series of (sign-posted) public rights of way also cross the grounds. 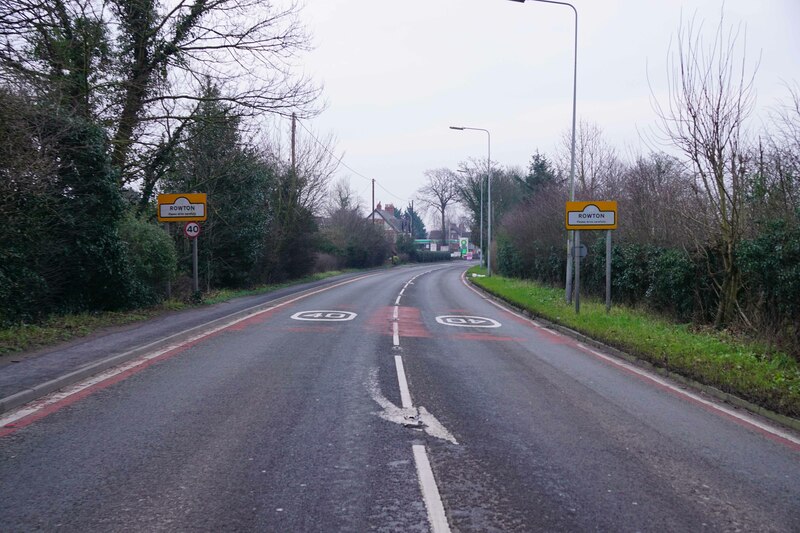 Care should be taken along the A41 as it is a busy road link into Chester. King Charles Tower. This medieval turret was known as Phoenix Tower at the time of the battle. Allegedly King Charles watched the final stages of the battle from here as his cavalry was slaughtered in the Chester suburbs. 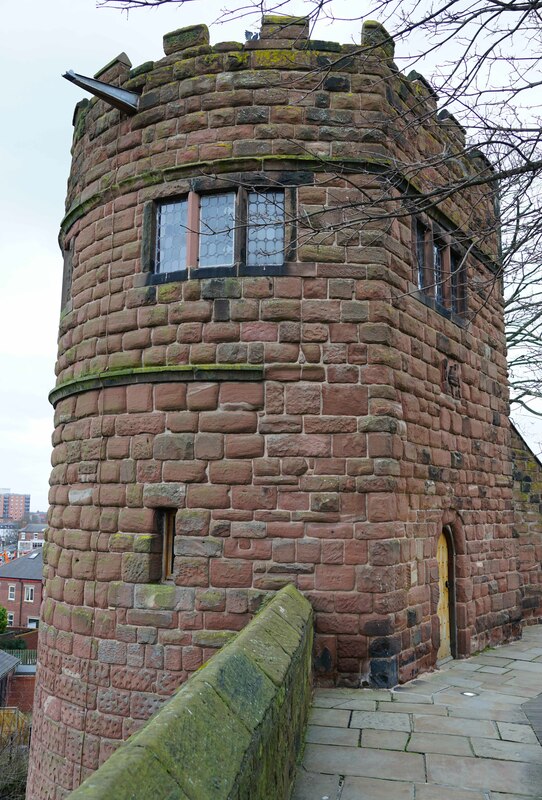 The tower is irregularly opened to the public as part of the Chester walking tours. A41. The A41 broadly follows the line of the contemporary road but is much wider. 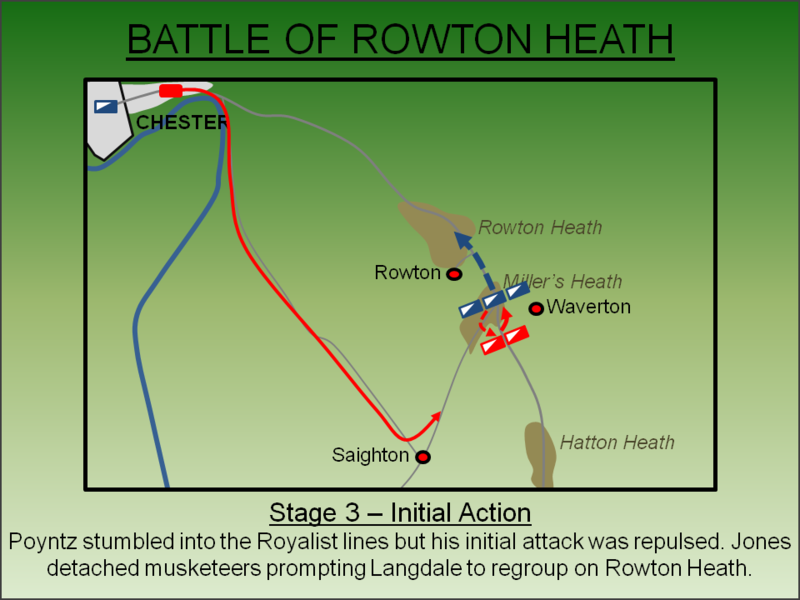 The Royalists initially formed up at Hatton Heath (top) whilst the Parliamentarians deployed on Rowton Heath (bottom). In Vicinity of Miller’s Heath. Scene of the first stage of fighting. Today it is in use as farmland but at the time of the battle this was uncultivated heath. Rowton Lane. Scene of the second stage of fighting after Langdale had regrouped following the arrival of the Parliamentary musketeers. 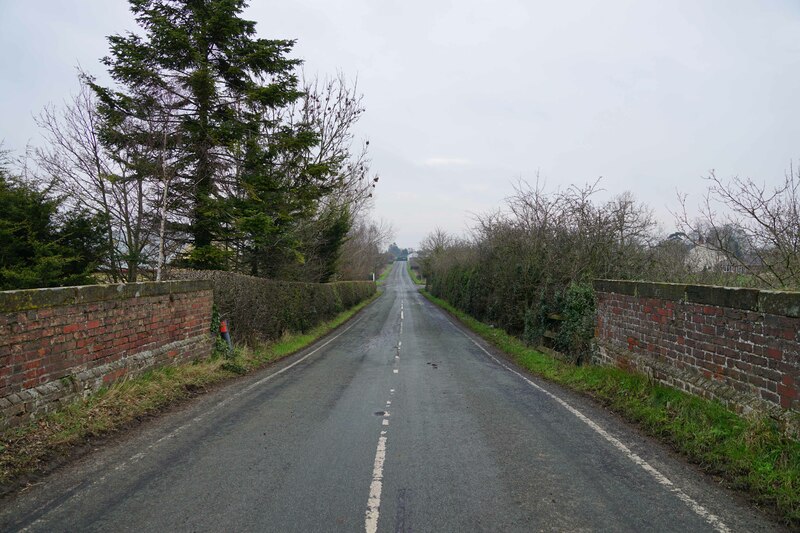 The roads were all narrow and lined by hedges - a slight sense of which is preserved here at Rowton Lane. Whitchurch Road (A41) was described in contemporary accounts in a similar manner but is now obviously significantly wider. Saighton Lane. This lane was used by some of the Royalists to escape back to Holt after the defeat in the Chester suburbs. Farmland. Either side of the main road much of the land has now been drained and cultivated as farmland. At the time of the battle most of the terrain was moorland. The battle followed the line of the Whitchurch Road (A41). Various car parking options exist along the route (several shown on the map below).